Members of the Contested Terrain class are creating a media campaign that will culminate in a public event on Saturday, November 19, just before the start of the holiday shopping season. Here is more detail on each of the individual projects and a rough schedule for the day. People walk by this hole every day and nobody bothers to look up why there is such a gaping hole in our city. Meanwhile, the people in power are taking all the time in the world to stubbornly fight with each other, accomplishing absolutely nothing. By starting with the question, “What do YOU want to see built here?” I hope to spark some interest in the people of Boston about the conflict. A quaint dinner to finish off a robust day of activities and media. Mayor Thomas Menino, Vornado CEO Steve Roth,and BRA chief Peter Meade will all join Jonathan Baruc for a lovely meal with a menu comprised of donated dishes from local restauraunts such as Elephant & Castle, Petit Robert Central, and Mantra. The 3 key players will reflect upon the day, find solidarity and hopefully discuss the future of the abandoned development. The idea of this intervention is to have an artifact sale on the day of the event. The artifacts sold will reflect what has been left behind in the Downtown Crossing hole. These objects will be placed in a miniature model of the hole. It will be a statement as to how the hole has become part of Boston’s history and how the artifacts are bits and pieces of that history. The Running of the Brides once was once a famous tradition at the Basement, and today it will be an event to raise money for the Making Memories Foundation for Breast Cancer. This event invites participants to wear their pink and take a lap around the Filene’s Basement site, in commemoration of the store and to fight breast cancer. Travel Back In Time, See what Downtown Crossing was like before this whole mess started. Viewmasters on the BID tables next to the hole in Downtown Crossing offer historical views of the site that is now the scourge of Boston. You are invited to handle and enjoy these viewmasters as they take you through history. 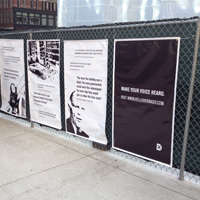 If you’d like to help bring prosperity back to Boston, we invite you to add your voice to ours and visit hellovornado.com. Like Massachusett’s historic drivers, the stagnant hole in Downtown Crossing is creating lots of negative attention. This “masshole” has been left undeveloped for years and the promise of development seems like it will never come. As pedestrians walk through the area, they’ll come across a large arrow directed towards “Boston’s Greatest Masshole.” The intent is to bring attention back to hole and engage pedestrians in conversation. Vornado promised Boston a new building but left us with a hole in the middle of downtown. 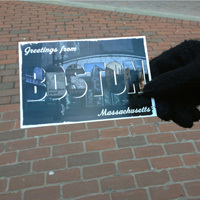 Boston means a lot to the residents of the city. 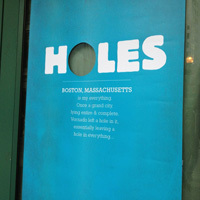 Holes is a poster campaign directed at Vornado that was designed to visually make the analogy between Boston and the other things of importance in people’s lives. The series focuses on the future degradation of the downtown crossing area due to Vornado’s unwillingness to develop anything. The aim of the project is to engage the community and have them directly voice their opinions to Vornado while also showing Vornado the negative impact they are having on our community. A series of banners displaying quotes from members of the community. Developers, small business owners, major CEO’s, downtown shoppers and everyone else will be represented on these large-scale posters. 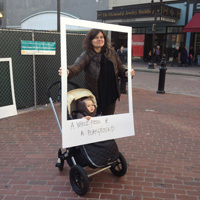 HelloVornado.com focuses on the opinion of the whole Boston community. Not wanting to have anyone left out, different parts of the site are captured in a 360° panoramic shot, providing people who are not in the immediate area with an intimate view. 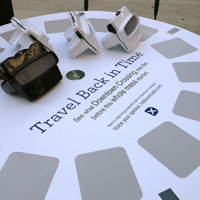 The different views are accessible to people in downtown by their phones and QR codes.